Radhika was born with a cleft lip and palate in a small village in the Thiruvannamalai district of India. Dhanalakshmi, Radhika’s mother, reported that it was very difficult to get her primary surgeries done at a government hospital and she was not able to afford the cost of travel for follow up appointments. In 2005, Radhika was admitted into our project run by Sri Ramachandra University (SRU). Here, she was able to receive orthodontic care and speech therapy services directly in her community. 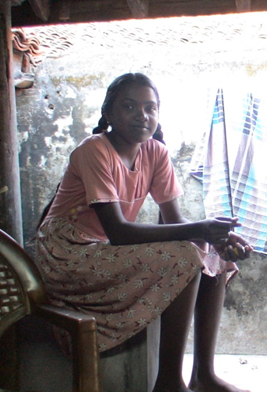 Today, Radhika is 19 years old and among the oldest beneficiaries enrolled in our partner project in India. Thanks to the support she has been able to access close to home, Radhika says she gained the self-confidence to face the outside world and was treated the same as the other children in school. While in school, Radhika developed an interest in English and became a highly accomplished English speaker. She has now started college and hopes to become an English teacher one day. She said she would also like to help transform the lives of other children who have had a similar experience.